Breakfast | eat. cook. blog. Easy. Delicious. And, really, how cool looking is it – all puffy in that cast iron skillet? I had never even heard of a “Dutch Baby” until I bought my copy of the Smitten Kitchen cookbook last fall. But when I saw her gorgeous photo and read the description and ingredients for Gingerbread Spice Dutch Baby, I knew I had to try it. Kind of sounded like a cross between a popover, and the Swedish pancakes my mom used to make when we were kids, but with gingerbread spices thrown in. My kind of breakfast! So one chilly Sunday morning I made one. So easy. I mean, really, SO easy (like, seriously, you mix the ingredients in a blender and then bake it for 15 minutes in the oven). And delicious. It’s amazingly light and hearty at the same time. And it makes your kitchen smell really good. 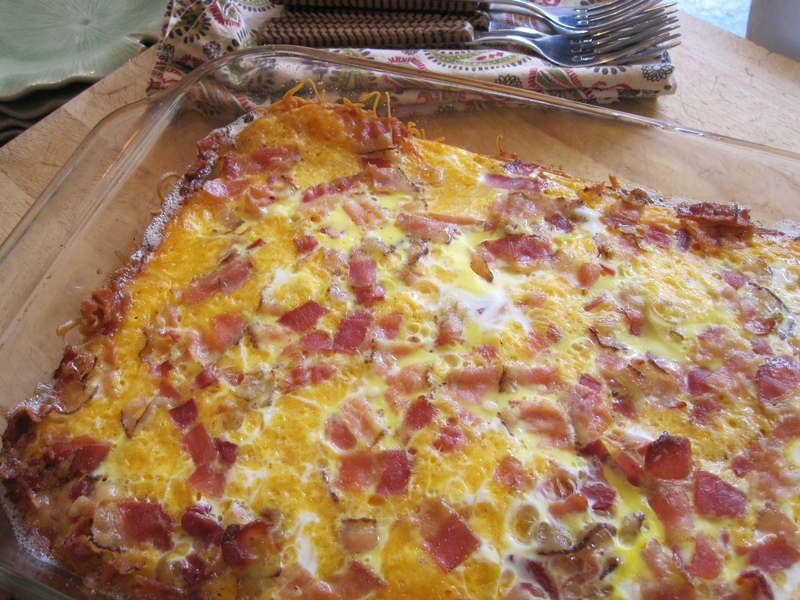 A perfect weekend morning breakfast treat…I’ve made them dozens of times since. Preheat the oven to 400°F. Place the eggs in a blender and blend for 1 to 2 minutes, until smooth and pale in color. Add the brown sugar, molasses, flour, cinnamon, ginger, cloves, nutmeg, salt, and milk and blend until smooth. Melt the butter in a 9-inch ovenproof skillet over high heat, swirling it up the sides to evenly coat the pan. Pour the batter into the skillet and immediately transfer to the oven. Bake for 15 to 20 minutes, until the pancake is puffed up. Remove from the oven, dust with powdered sugar, and drizzle with maple syrup. Serve immediately. The first time I had a Salade Lyonnaise was at a birthday lunch for my sister-in-law Kelly at Café Chloe (a cute little French restaurant here in San Diego) and I was instantly in love. The combination of bitter greens (typically frisée), lardons (crisp bacon pieces), croutons and a poached egg tossed in a warm vinaigrette…c’est bon. Then our friend Christine (of “Blanquette de Veau” fame) served it at a dinner party at her home. Again. C’est bon. So when I saw that Smitten Kitchen posted a recipe for a sandwich that was inspired by Salade Lyonnaise, I knew I had to make it. She fries the egg, rather than poaching, and uses a little of the bacon grease to make the vinaigrette (oh my!) and adds crumbled blue cheese, all on a crusty ciabatta roll. C’est très bon. It’s a quick and easy and really delicious weeknight dinner. Add a glass of white Burgundy, some pommes frites (aka shoestring French fries) and voilà…you’ve turned your kitchen into a little French bistro! Split your rolls and put them in to toast. Place frisée in a medium bowl. Cut bacon crosswise into 1/4-inch wide lardons. In a small heavy skillet, cook bacon over moderate heat, until pieces are crisp. With a slotted spoon, transfer bacon to paper towels, reserving bacon fat in pan. Add shallot to bacon fat and cook for one minute, stirring. Add red wine vinegar and let hiss and bubble for 20 to 30 seconds, then remove from heat and whisk in Dijon. Immediately pour hot dressing over frisée and toss with drained lardons, salt and pepper. Remove rolls from toaster and divide bacon-frisée salad between each bottom bun. You’ll want to heap on more than seems feasible or needed, especially once you realize how tasty it is. Top each salad pile with half (2 tablespoons) of the blue cheese. Reheat skillet over medium-high heat. Add the butter and swirl it to coat the pan. Crack one egg into the skillet, season with salt and pepper and reduce heat to medium. I like to cover the skillet with a small lid at this point, as it seems to help the egg cook faster and more evenly. In one minute, you should have a perfect sunny-side-up egg. However, I find that for this sandwich, to somewhat rein in the mess, it helps to then flip the egg for 20 to 30 seconds, until the yolk is still runny, but less likely to run right off your sandwich. 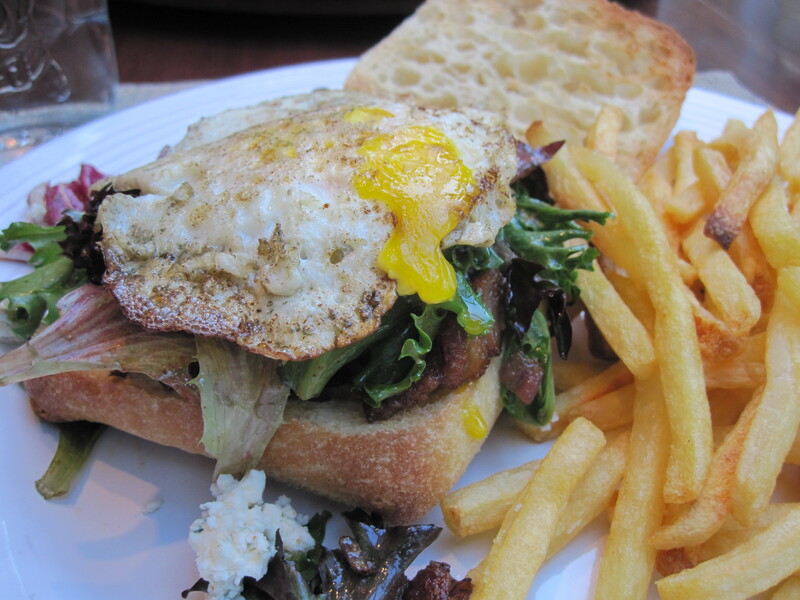 Remove the egg from the pan and place it on top of the bacon-frisée salad on the bun. Repeat with remaining egg and come on, what are you waiting for? Dig in. Debra, one of my very favorite coworkers, had a birthday (a BIG birthday) last month. Okay, really, Debra’s not just one of my favorite coworkers, but one of my very favorite people on the whole planet. Really. She’s kind and thoughtful and funny and generous and has a laugh that is absolutely contagious. I was invited to her surprise party but couldn’t make it, so I wanted to do something special to make up for missing it. I asked her wife what her favorite baked good was. 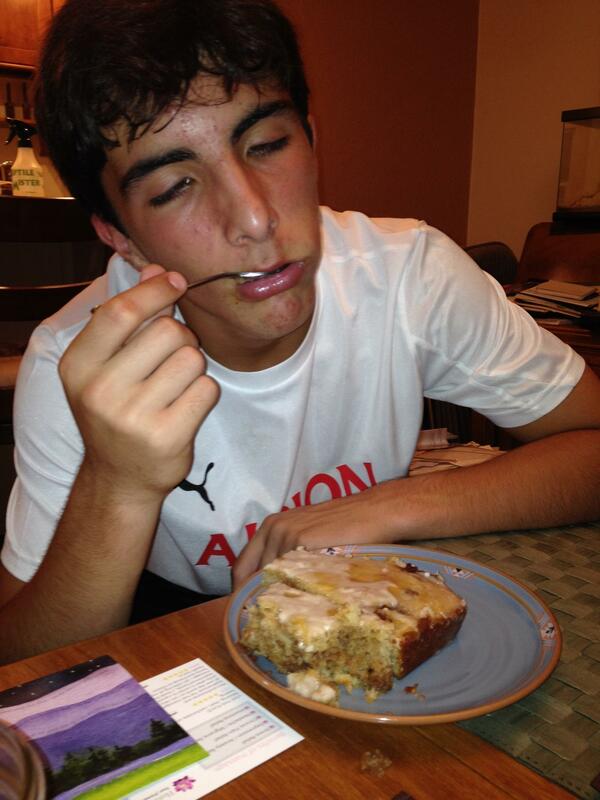 She said, “Deb loves cinnamon rolls…lemon bars too, but cinnamon rolls are her favorite.” Cinnamon rolls. Hmmm…I think I’ve made them once or twice and I really didn’t have time to do the whole wait-for-the-yeast-to-rise thing. Then I remembered seeing a recipe that someone had posted on Facebook for a Cinnamon Roll Cake. I tried to find which friend had posted it (spent way too much time on that little venture), but couldn’t. So I Googled. Duh. There were dozens of them…seems to be a popular recipe on Pinterest and the food blog circuit. And they are all exactly the same recipe. So I went to the blog that I thought looked cutest (The Girl Who Ate Everything) and made that one. It was really easy and smelled heavenly while baking. So here you have it. 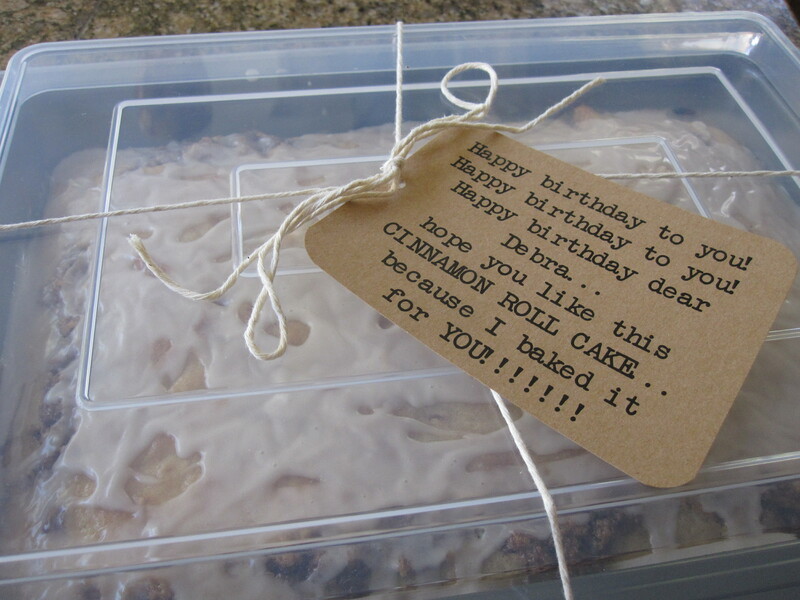 Cinnamon Roll Cake. 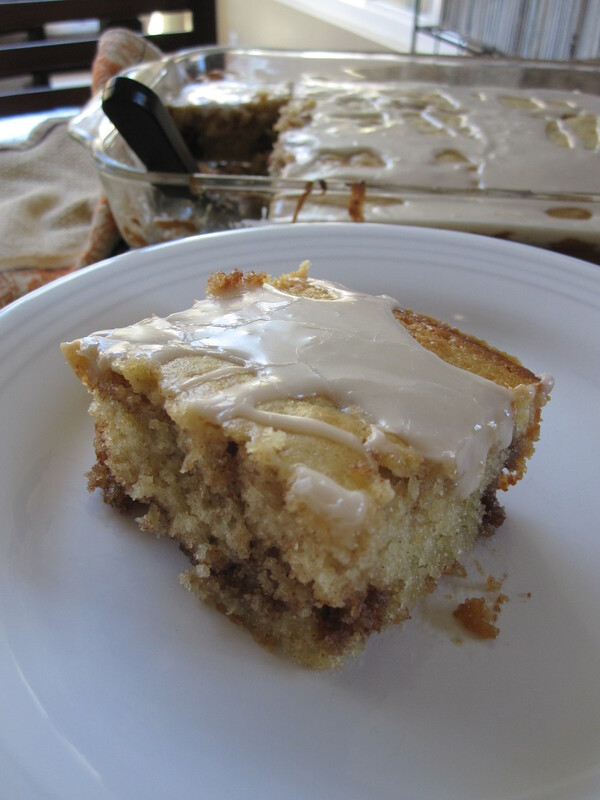 Like coffee cake and cinnamon roll all in one. You don’t even have to wait until one of your favorite people’s birthday. Make one this weekend. You’ll be so happy you might even laugh like Debra. Mix everything together except for the butter. Slowly stir in the melted butter and pour into a greased 9×13 pan. For the topping, mix all the ingredients together until well combined. Drop evenly over the batter and swirl with a knife. Bake at 350° for 28-32 minutes. While still warm drizzle the glaze over the cake. It’s rare that both of our kids are in San Diego at the same time. 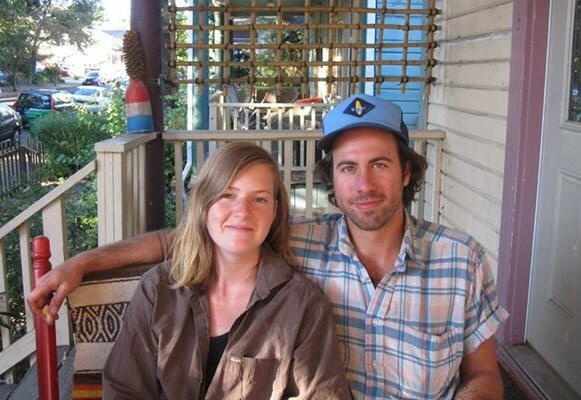 Kyle is 26 and lives in Portland, OR and Ally, 24, lives in New Orleans. But a couple of weeks ago, they were. And, really, there’s nothing that makes me happier. Ally is here, off and on, for a longer stretch before the wedding. I picked her up at the airport after she had been in Mexico City for two weeks and she and I drove to LA for Calla’s shower/camping/hiking/fair maiden weekend. Then we came back. Then Kyle was here. Then Kyle went to Mexico, then back to Portland. Then Ally left for a week to teach drumming to 7 to 9 year old girls at the Bay Area Girls Rock Camp (how cool is that?) And now she’s back. And her boyfriend Jackson will be here. And then we’ll all leave for Sonoma for the wedding. Kyle and Calla’s wedding!!!! In 10 days!! So they were both here on the Friday morning before Kyle left for La Fonda. I made Wake-Up Casserole. Everyone was happy. Especially me (and it didn’t have anything to do with the casserole)! Preheat oven to 350°. Grease a 13×9″ baking dish. Place hash brown patties in a single layer on bottom of dish. Sprinkle with cheese and bacon (or ham). In a bowl, beat eggs, milk, salt and mustard. Pour over cheese and bacon (or ham). Cover dish with foil and bake for 45-50 minutes. Uncover; bake 10-15 minutes longer until edges are golden brown, eggs are set and a knife inserted near the center comes out clean. This recipe was in the April 2012 issue of Bon Appétit, in their RSVP section (where readers write in to request their favorite restaurant recipes). The reader who wrote in said, “The sublime pistachio pound cake at the Tasting Room in Houston is my dream dessert.” And as soon as I read through the recipe, I couldn’t wait to make it. And I did. And it was so good that I was just looking for excuses to make it again. For a couple of months, any time we either entertained here or we’d go to someone’s house for dinner, I’d volunteer to bring a dessert and I’d make another Pistachio Pound Cake. 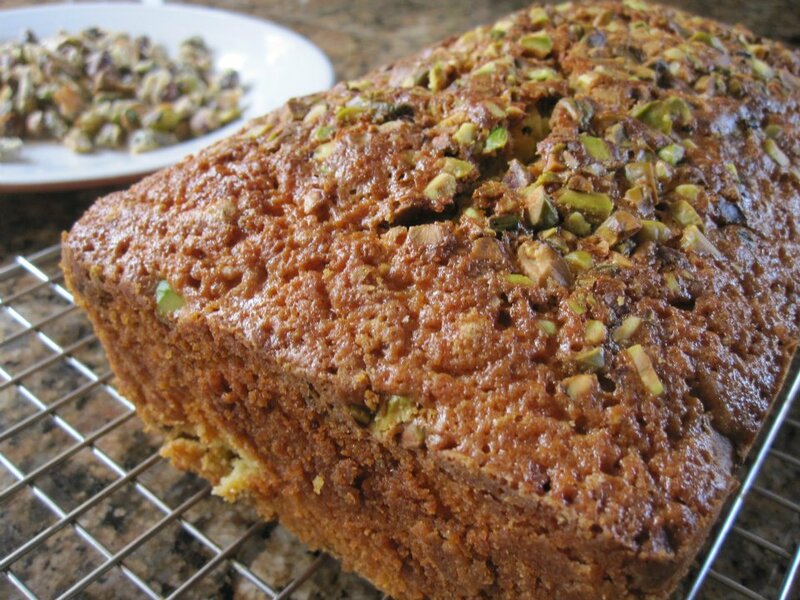 It’s buttery and light and citrusy and full of pistachios (don’t you just love pistachios?) And it’s absolutely gorgeous when you slice into it. Yes, even sublime. It’s delicious “dressed up” for dessert with some fresh whipped cream on the side (and maybe even a sprinkling of sugared pistachios…I did that once) and perfect for breakfast with coffee. Anybody have a good excuse for me to make another one? Arrange a rack in middle of oven; preheat to 325°F. Coat a 9x5x3″ loaf pan with nonstick spray. Dust pan with flour; tap out excess. Whisk 2 cups flour, salt, and baking powder in a medium bowl. Using an electric mixer, beat butter on medium speed until light and fluffy, 2-3 minutes. Add sugar; beat until well incorporated, 1-2 minutes. Add eggs one at a time, beating to blend between additions. Add juices and zests; beat until well combined (mixture will look curdled), 2-3 minutes. Add dry ingredients; reduce speed to low and beat just until blended. Fold in 3/4 cup pistachios. Pour batter into prepared pan; smooth top. Sprinkle remaining 1/4 cup pistachios over. Bake cake, rotating halfway through, until a tester inserted into center comes out clean, about 1 1/2 hours. Transfer to a wire rack and let cool completely in pan. Run a sharp knife around sides to loosen; unmold cake. DO AHEAD: Can be made 1 day ahead. Store airtight at room temperature. 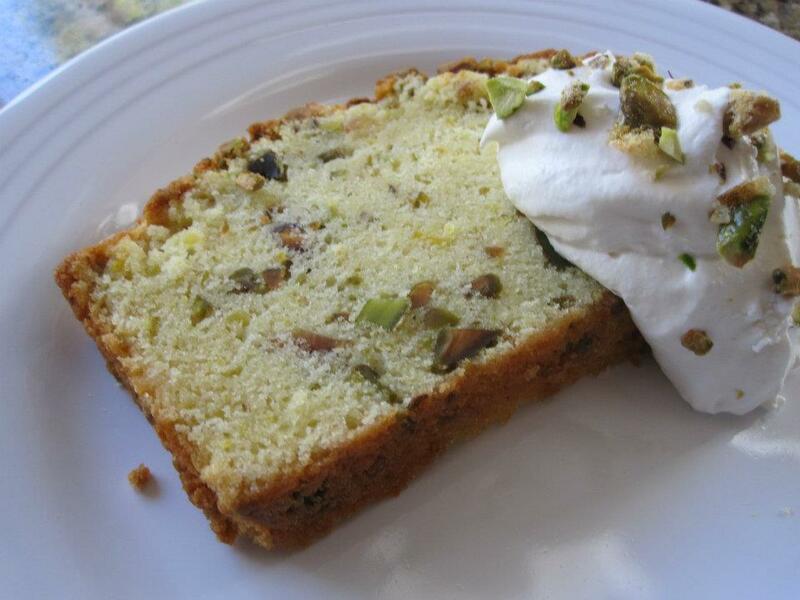 Serve accompanied with a dollop of freshly whipped cream and sprinkled with a few sugared pistachios (optional). Heat oven to 350°. Line a rimmed baking sheet with foil or parchment paper. Slightly whisk an egg white in a small cup. Transfer 1 tablespoon egg white to a medium bowl; whisk until frothy (discard remaining egg white). Add 1 cup coarsely chopped pistachios and 3 tablespoons sugar; toss to combine. Spread on lined baking sheet. Bake for about 8 minutes or until dry and toasted. Cool; break apart. A couple of Saturdays ago we had dinner at our friends Chip and Dale’s (yes, you read that right). Chip had cooked a couple of pork butts on his beloved Kamodo grill (and not a “Big Green Egg” kamado…Chip’s is the authentic kind, made in Mexico) and then shredded the meat for carnitas tacos. Everything was muy delicioso, as it always is at Chip and Dale’s (stop snickering…those are their names) and, as usual, there was a ton of food and a ton of food left over, so Dale sent us home with our own little stash of shredded pork. Come Monday, I’m driving home from work and thinking about how much I’m looking forward to making our own carnitas tacos for dinner. Alas, I open the fridge to discover that someone (who shall remain nameless, but he’s the only other person who lives at this house) had been snacking on the leftover pulled pork. Slight change of plans. What shall we make? And, at this point, I don’t feel like going to the grocery store, so what shall we make using what we have on hand? 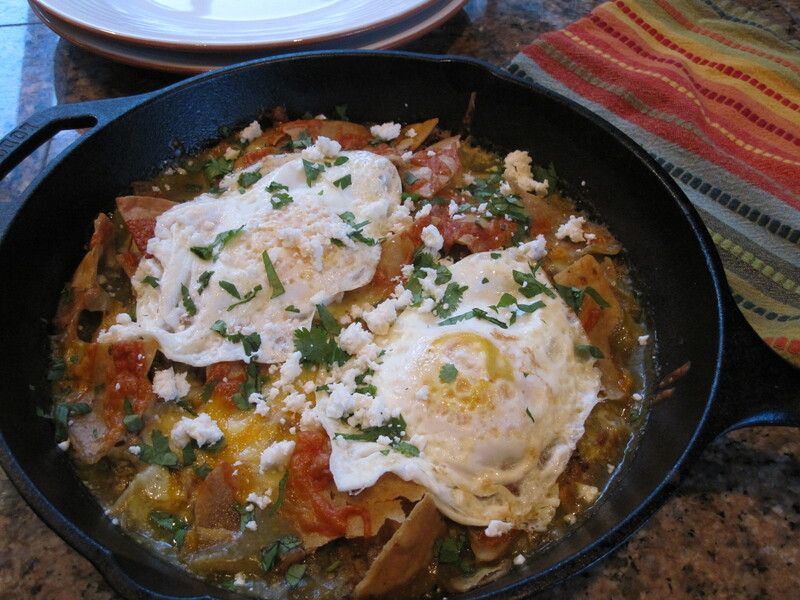 Tortilla chips, eggs, cheese, salsa verde, a little sour cream…Chilaquiles! Chilaquiles (pronounced chee-la-KEE-les) is a traditional Mexican dish, usually eaten for breakfast or brunch, that consists of fried tortilla strips simmered in a red or green salsa. From there, you find many different variations, with additions such as fried or scrambled eggs, cheese, chiles, shredded chicken or pork, sour cream, onions and cilantro. I found a recipe that looked interesting and easy at Redbook magazine online. It’s a baked version and you basically just layer all the ingredients lasagna-style and then put it in the oven for ten minutes. It was suggested as a way to use leftover Thanksgiving turkey. It was really, really good (and really, really easy). The guilty leftover-pork-snacking-person just kept saying, “yum” between bites. We’ll be making this one again… I’ll have to remember it next November! Note: just made these again. I skipped the whole first step of simmering the salsa in oil. No need. Just put a generous tablespoon of oil in the ovenproof skillet before starting the layering. Heat oven to 425º. In a small saucepan, heat 1 tablespoon canola oil over medium heat. Add salsa and heat to simmering. Spray a large, deep ovenproof skillet with cooking spray. Spread half of the salsa on bottom of skillet. Add half of the shredded meat, half of the chips, half of the sour cream, and half of the cheese. Repeat with the remaining salsa, meat, chips, sour cream, and cheese to make one more layer. Bake for about 10 minutes, or until hot and cheese has melted. While that’s baking, fry your eggs. Remove chilaquiles from oven and spoon onto individual plates then top with fried egg, crumbled Cotija cheese (if using) and fresh cilantro. The other day, at the end of the work day, I was sitting in my cubicle and heard people laughing and talking about banana bread. So of course, I assumed there was some banana bread to be had and made a B-line for the office where the laughing and talking was coming from. I was a little disappointed to see only a big box of past-their-prime bananas that were definitely ready to be made into banana bread. 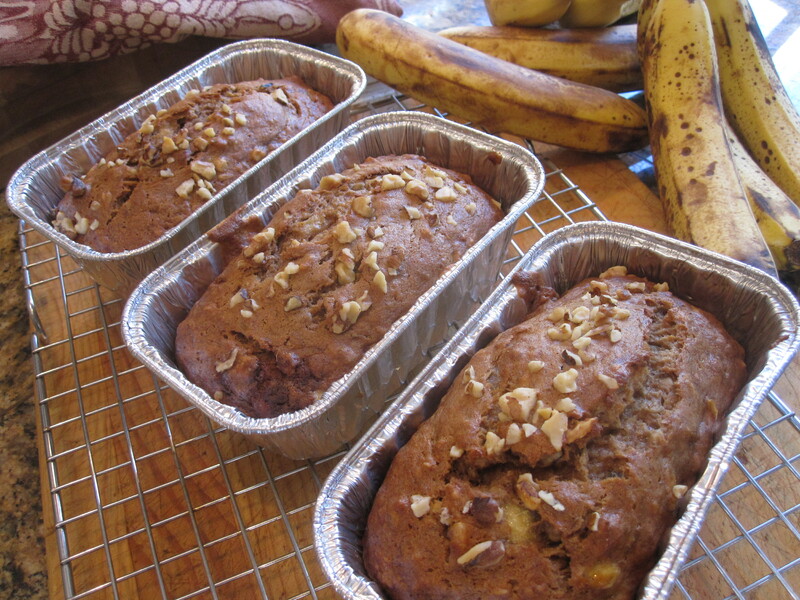 I actually had been thinking about Smitten Kitchen’s “jacked up banana bread” and the following day we were having one of our monthly potlucks, so I grabbed a couple of bunches. 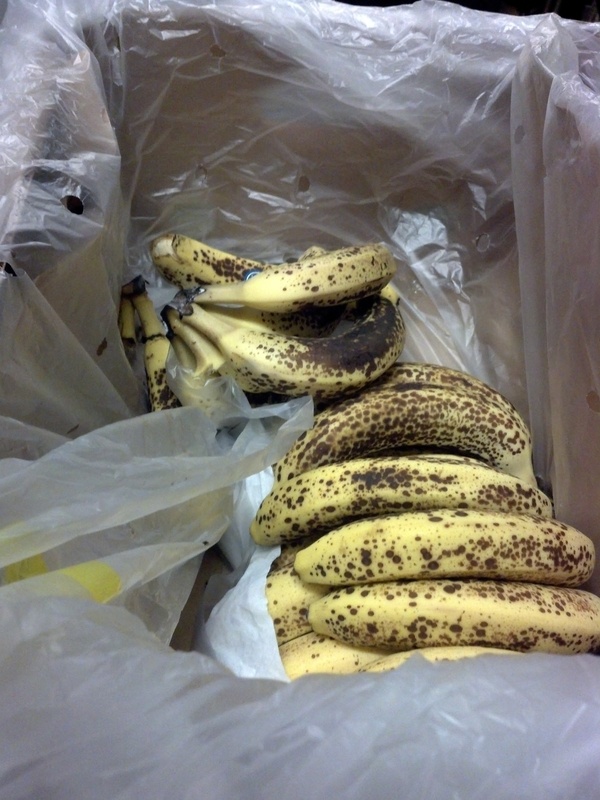 I didn’t catch the story of why or where the bananas came from, but when someone else asked the banana bearing coworker why she had so many bananas, naturally, I broke into my best Harry Belafonte “come Mr. Tally Man…tally me banana!” Lol. Hey. It was the end of the day. SK’s recipe is just about the best banana bread I’ve ever had. And its really easy. One bowl and a wooden spoon. The only thing I change is that I add walnuts. And name given this recipe by Deb of SK is “Elise’s Friend Heidi’s Friend Mrs. Hockmeyer’s Banana Bread, As Jacked Up by Deb (adapted from Simply Recipes)”. That’s a little long. Let’s just call it Tally Me Banana Bread. Preheat the oven to 350°F. With a wooden spoon, mix butter into the mashed bananas in a large mixing bowl. Mix in the sugar, egg, vanilla and bourbon, then the spices. Sprinkle the baking soda and salt over the mixture and mix in. Add the flour last, mix. If using walnuts, stir in 1/2 cup now. Pour mixture into a buttered 4×8 inch loaf pan. Sprinkle remaining 1/4 cup walnuts on top. Bake for 50 minutes to one hour, or until a tester comes out clean. Cool on a rack. Remove from pan and slice to serve. 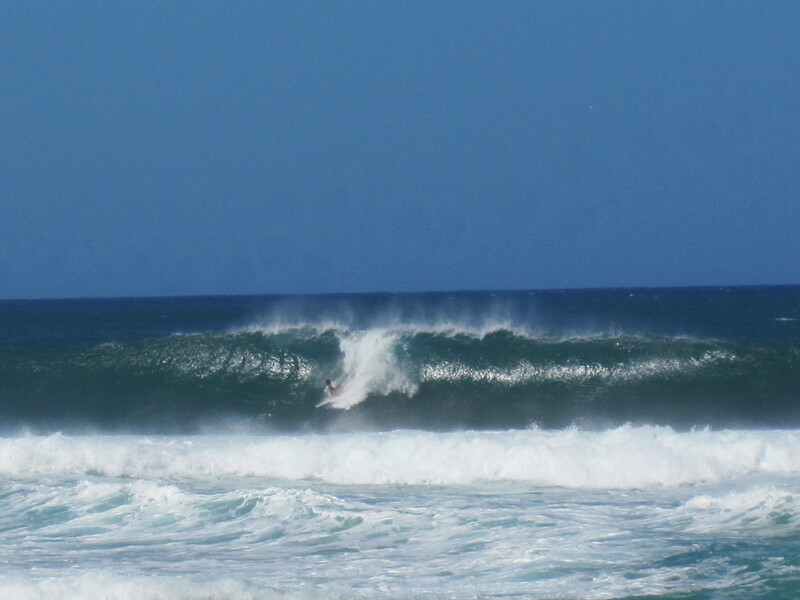 Tony and I recently went to Oahu, Hawaii. Well, actually, Tony was there on business (my father-in-law owns a commercial property in Honolulu and for the past year or so, Tony has been helping out with the property management) and I was finally able to “tag along” and flew over to meet him for a few days. We had a really great time exploring the island. 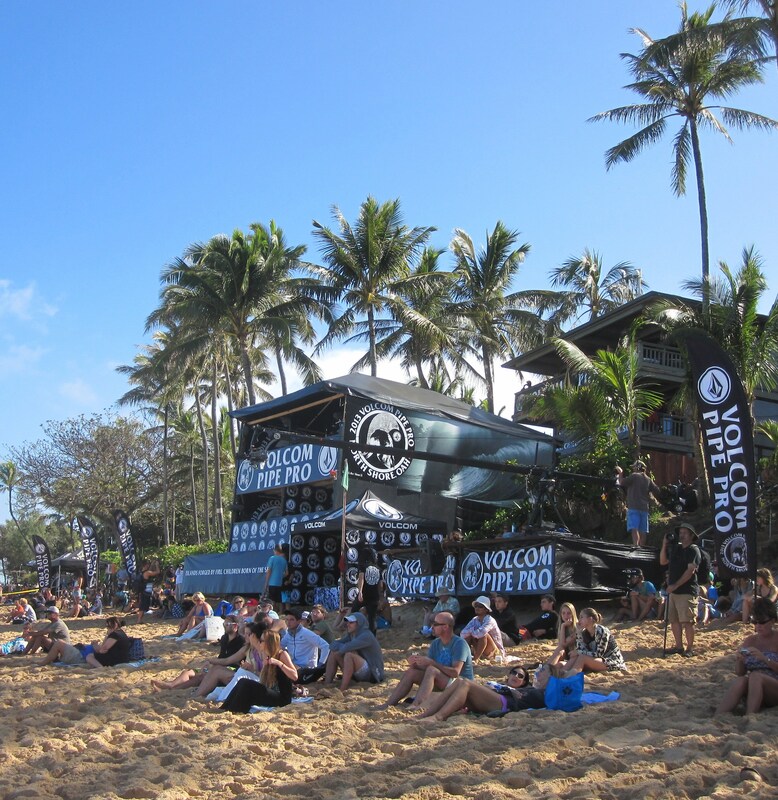 We drove to the North Shore one day and just happened upon the Volcom Pipe Pro surf contest at Banzai Pipeline. THAT was very cool. 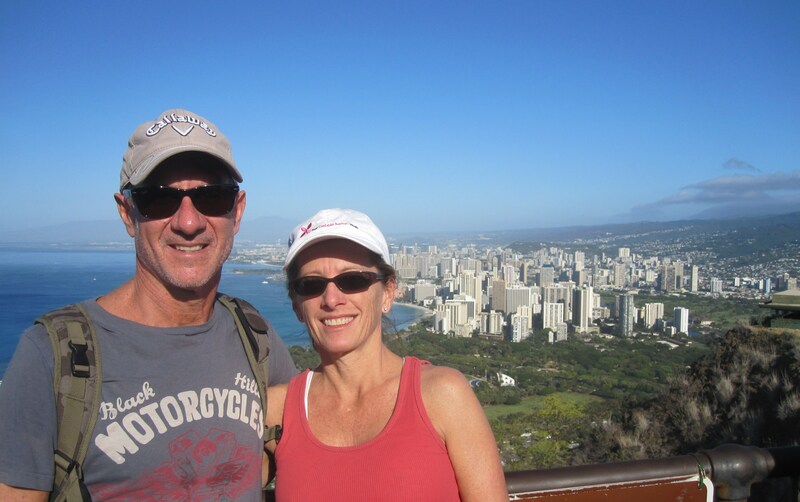 We did a couple of really beautiful hikes…on the Kanealole Trail in the rainforest and all the way to the top of Diamond Head crater. 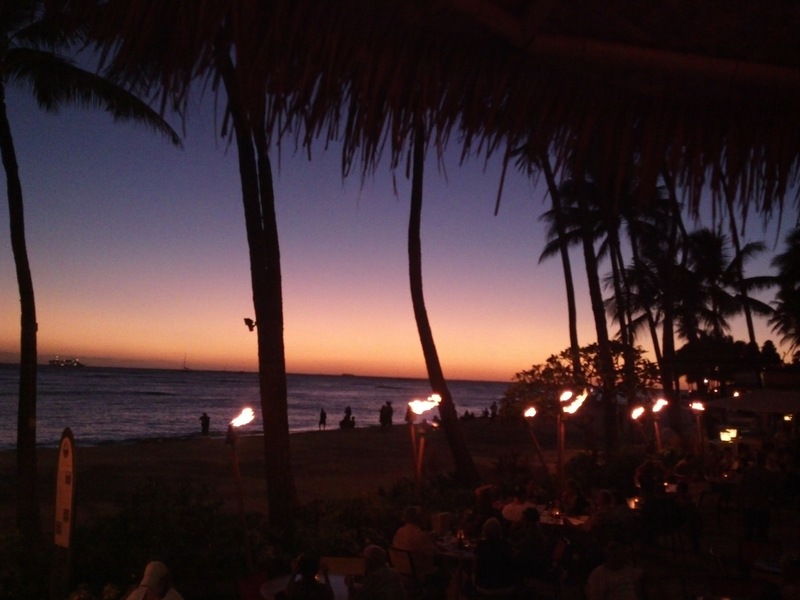 We even spent a little time just relaxing on Waikiki Beach and watching spectacular sunsets from our lanai. And, I guess it goes without saying, we ate some really good food too – fabulous dinners at Town (by far my favorite…the Salted Chocolate Pretzel Tart was to die for!) and Nico’s at Pier 38; mai tai’s and a gorgeous sunset at Duke’s and a yummy and healthy lunch at the very hip Fresh. 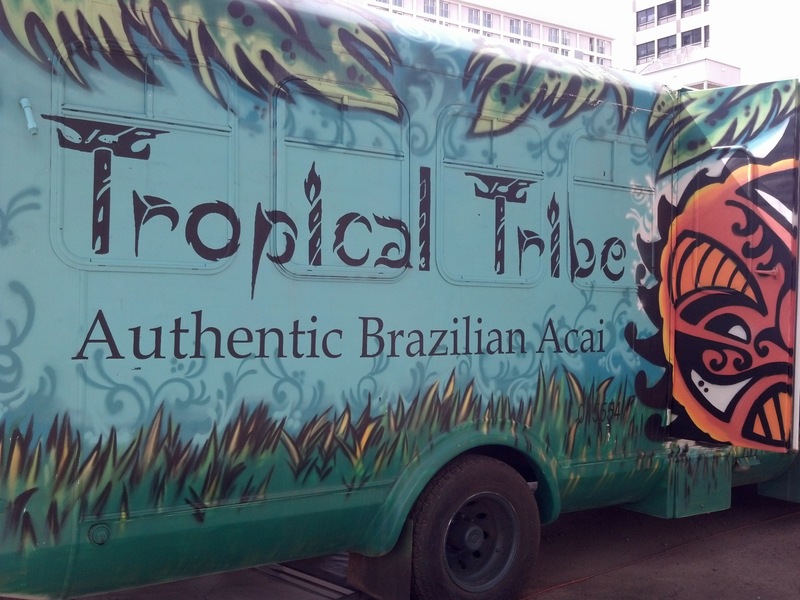 I even had my first ever Acai bowl from the Tropical Tribe food truck…which brings me to the point of this post. Acai. Pronounced ah-sah-yee. The latest “superfood” that’s been popping up in health food stores and breakfast cafes and smoothie shops. The berries are supposedly good for everything…anti-aging, weight loss, and overall health. They come from acai palm trees found in Central and South America. I admit I’m usually pretty skeptical anytime anything is called a superfood (I tried the goji berry and blech!) 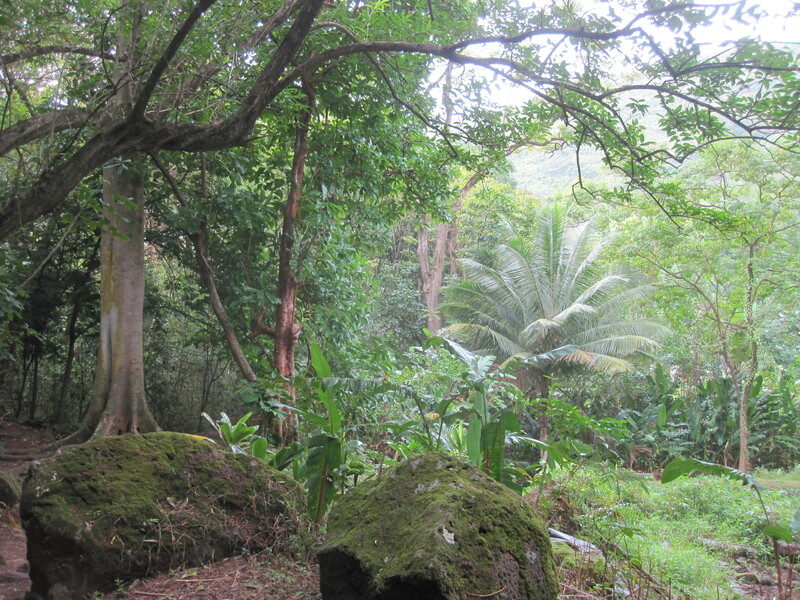 and it wasn’t really on my list of top five things to do in Hawaii, but the young Brazilian guy who owns Tropical Tribe is considering leasing space from my father-in-law, so Tony suggested we go by and give it a try. So we did. We had just finished our Diamond Head hike and were pretty hungry. 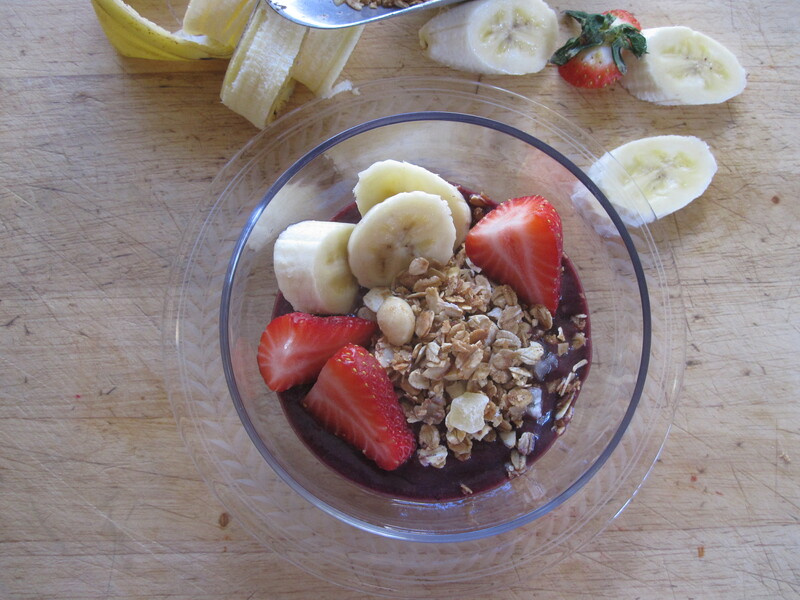 They do acai shakes and bowls…we opted for the bowl, served with granola, a little fruit and drizzled with honey. It was a delicious, healthy and satisfying mid-morning snack. So, upon returning to San Diego, I was inspired to make my own acai bowl, but frankly, didn’t know much about acai or where to even buy it. I Googled and must have found a hundred different recipes. 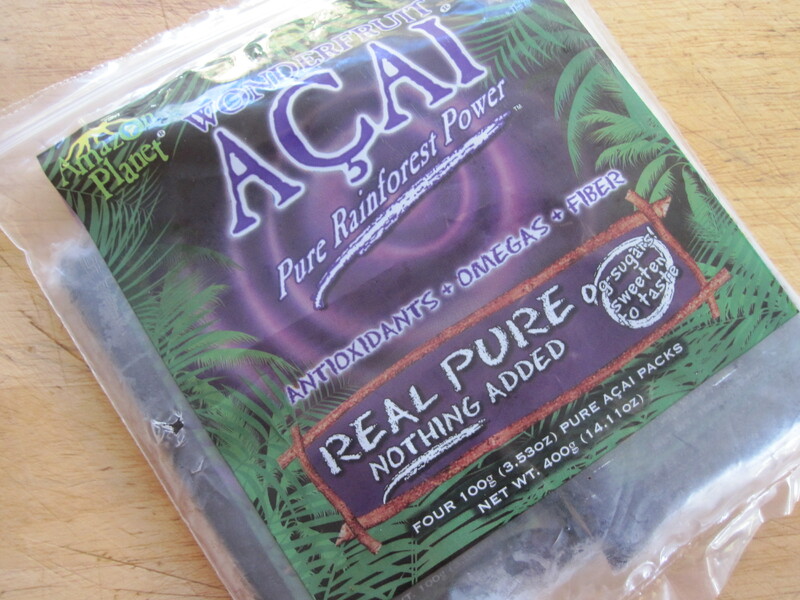 And, as it turns out, our local health food store carries acai in the frozen individual puree packets. (Apparently, you can also buy it in juice form and even sorbet.) So I bought some and played around and experimented with a couple of different recipes. You’re basically just making a really thick smoothie. The instructions on the brand I bought said to just break up the frozen packet and put it in a blender with some frozen fruit, a little liquid (if needed) and a little sweetener (if desired). Well, I don’t know if it’s because our blender is about a thousand years old, but those frozen chunks of acai weren’t going anywhere at first! I had to let them defrost a bit. Then I blended the acai, frozen fruit and juice together until smooth; added half a banana and some agave syrup. I topped it with some Everyday Granola (new tropically inspired version! ), sliced banana and strawberry. Is it a superfood? Am I aging less? Lol. that has yet to be seen, but it is yumminess and aloha in a bowl! Defrost acai packet slightly (if you have a really powerful blender, you probably can skip this step) and put in blender. Add about a cup of your favorite frozen fruits. Pour in orange juice (you might need more or less of this too, depending on the thickness you want). Blend until smooth. Cut half of the banana into big chunks; add to blender. Add agave or honey. Blend again until everything is incorporated and smooth. Spoon into a bowl (or two) and top with Everyday Granola (tropically inspired version, see below, or regular); the other half a banana, sliced, and whatever other fresh fruit you like (berries are really good). 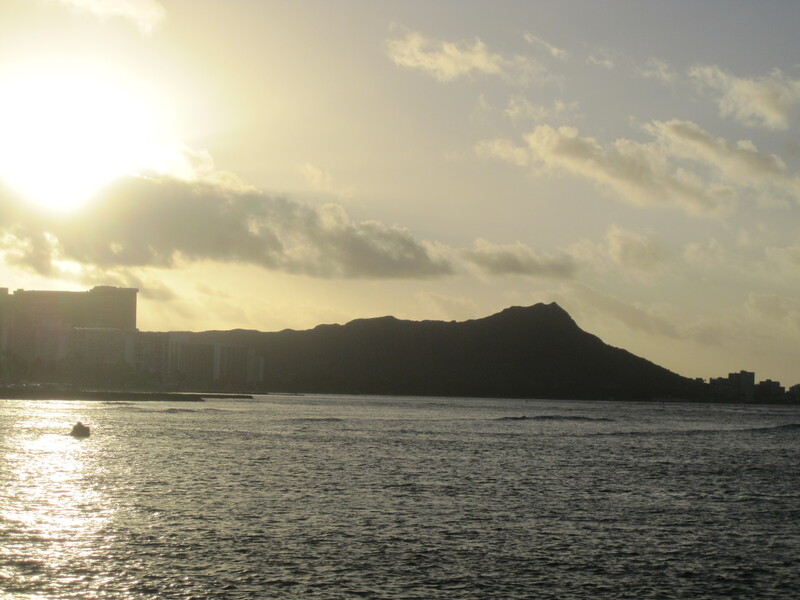 While we were in Hawaii, I bought some plain Greek yogurt and a bag of really expensive tropical granola to have for breakfast, while sitting on our lanai watching the sun rise over Waikiki & Diamond Head. The granola wasn’t as good as Everyday Granola, of course, but it did have big pieces of macadamia nuts in it. 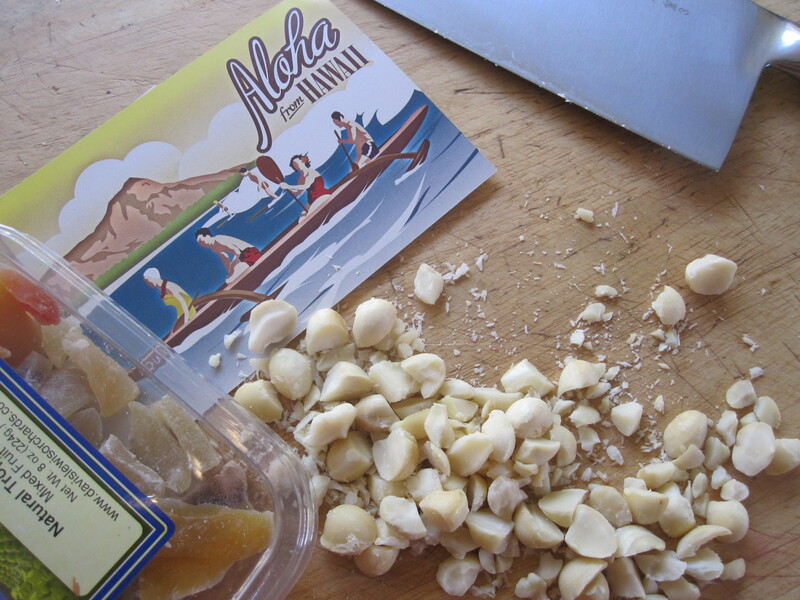 I love macadamias! Our friends Chip & Dale have a macadamia tree in their backyard and if you’ve ever wondered why macadamia nuts are so expensive, ask Chip & Dale about the whole process of picking them and shelling them and dehydrating them and husking them. Oy. I mean, I’m talking over 7300 nuts this year!!! We were the lucky recipients of a bag of macadamias, which I had been dying to use. Ah ha moment…tropical granola. So I made a batch of Everyday Granola, substituting the macs for pecans and a tropical dried fruit mix (kiwi, pineapple, mango, papaya) instead of my usual dried cranberries and golden raisins. We can’t get enough of this granola! Ever since the recipe (adapted from Molly Wizenberg’s Everyday Granola, Bon Appétit, June 2010) was published, I make a batch probably every other weekend. We eat it five or six days a week. I have mine with Greek yogurt and strawberries and Tony has his with milk. It’s so easy. 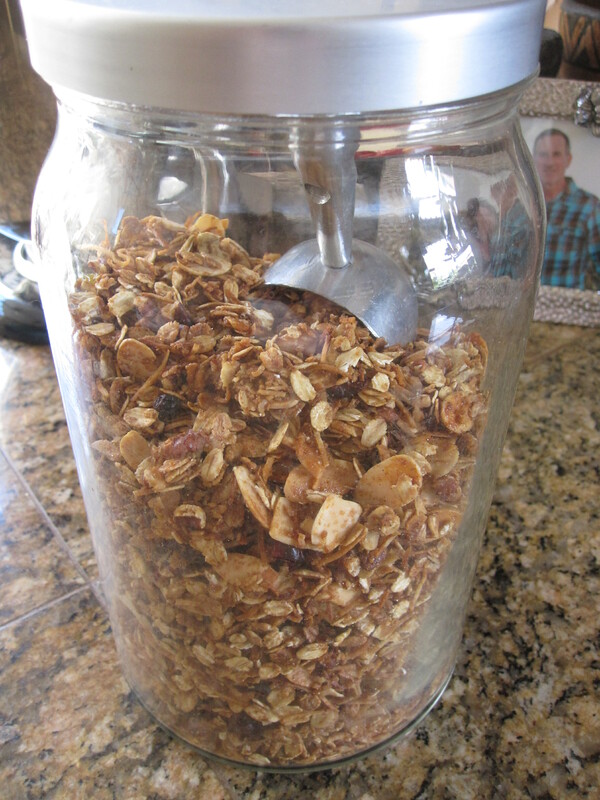 It makes your kitchen smell so good while it’s cooking and I promise, you’ll discover why Molly called it EVERYday granola! If you only read this blog once and make only one recipe, it should be this one. PS…Molly is a regular contributor to Bon Appétit. This recipe appeared in her column “Cooking Life.” I hadn’t paid much attention to her prior to this (aaagh…sorry Molly! ), but soon after, bought her book, “A Homemade Life” (which I LOVED!) and now follow her blog Orangette. Preheat oven to 300°F. Line rimmed baking sheet with parchment. Mix first 7 ingredients in large bowl. Stir honey and oil in saucepan over medium-low heat until smooth. Pour honey mixture over oat mixture; toss. Spread on prepared sheet. Bake until golden, stirring every 10 minutes, about 40 minutes. Place sheet on rack. Stir granola; cool. Mix in fruit. Store in an airtight container.